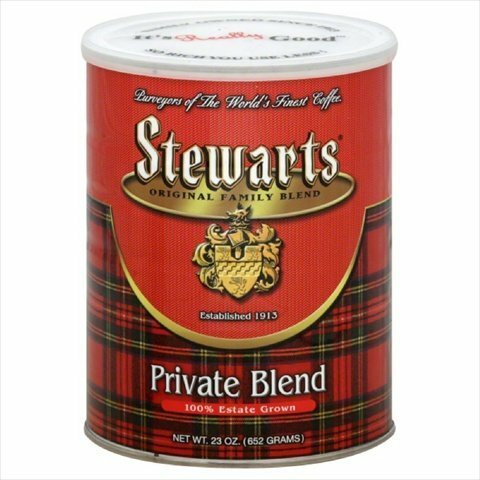 Stewarts Original Family Blend Private Blend Coffee, 23 Ounce (Pack of 6) by Stewart's at 365 Days Of Kindness. MPN: 072003054007. Hurry! Limited time offer. Offer valid only while supplies last. We use only 100 estate grown arabica beans for their exceptional quality and ensure the highest level of freshness.Features. Private Blend Coffee..
We use only 100 estate grown arabica beans for their exceptional quality and ensure the highest level of freshness.Features. Private Blend Coffee.. Item Weight - 23 oz.. Pack of 6.DirectionsBrewing Suggestions Specialty whole bean coffee ground for your convenience. To unlock the finest flavor from Stewarts Coffee store in a cool dry place keep it sealed and always brew with cold pure fresh water. For mild coffee Stewarts suggests using two scoons or one tablespoon of ground coffee for every 2 six ounce cups. For a stronger cup use two scoons or one tablespoon for 1 six ounce cup. Adjust according to your taste. Item Weight - 23 oz. Pack of 6.DirectionsBrewing Suggestions: Specialty whole bean coffee ground for your convenience. If you have any questions about this product by Stewart's, contact us by completing and submitting the form below. If you are looking for a specif part number, please include it with your message.